God loves surprises. Look at David who began his career as a silly, singing cowboy of sorts, a rock throwing, shepherding whippersnapper; shockingly, he became a kingly giant slayer. There is Moses, a foreign-born, stuttering, impatient murderer of a man; wonder of wonders, he was God’s chosen deliverer. Rahab is the biblical version of Calamity Jane, running a brothel in Jericho; miraculously, she saved an entire nation. Noah was a drunk; somehow he also built the incubator for humanity. Simon Peter was a loud-mouthed, hot-headed rambler who couldn’t shut up and wouldn’t show up when he was needed most; astonishingly, he became a Rock. Paul was a hump-backed, bug-eyed little weasel who made a living killing Christians – then he became one – and changed the trajectory of Western Civilization. And consider the Virgin Mary. While girls her age today are engrossed with Snapchat, Taylor Swift, and whatever else comes from Hollywood or Cupertino, she was busy birthing the Son of God. What a surprise! Who could have anticipated such a thing? She was just a little girl from Nazareth – but that’s exactly what made her a wonderment. First, she was little; that is, she was young. In the custom of her day, a woman would enter a prearranged marriage even before sitting for the SAT or getting a driver’s permit. So she was nothing but a novice. Second, she was a woman. Women in first century Palestine were not very liberated. In fact, they were often considered property; intended for domestic labor, sexual pleasure, and the manufacture of male heirs. Some rabbis of her time were debating whether or not women even had souls. So for a woman to be used as an instrument of God was considered a scandalous anomaly. And Mary’s third issue: She was from Nazareth. In Mary’s lifetime, there were no fewer than three major nationalistic rebellions in her hometown, and each of these insurrections were cataclysmically crushed by legions of Roman soldiers. To call Nazareth your home was to lay claim to one of the most rebellious and unruly regions of the Empire. It was a Jalalabad or Aleppo of the ancient world. So when it is said, “Mary was just a little girl from Nazareth,” that is a statement loaded with surprising characteristics. She was the wrong age, the wrong gender, and from the wrong neighborhood. Yet, these liabilities became the very pathways for Mary’s future. These things kept her in a place of dependence upon and submission to God. A man named Irenaeus was one of the first Christians who did serious thinking about Advent and its meaning. He came to the conclusion that Mary’s example of holy surrender was a pattern for us all; and he used a scintillating title for her. 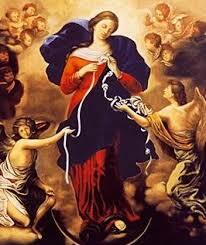 He said, “Mary is the undoer of knots.” Mary took the tangled mess she had been given and persistently worked it out, overcoming all her challenges in redemptive, surprising ways.